At Hivemetric, we spend a lot of time discussing the importance of a business’s financial model and operational metrics, but at our core we are really a technology company. We develop software that we hope will make the everyday lives of our users easier. 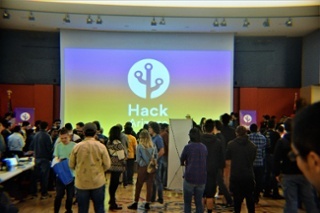 We recently sponsored a regional hackathon (@HackArizona) that attracted over 900 students to collaborate and work on projects for the weekend. For you finance gurus, investors, or anyone not connected to the tech community, a hackathon is basically a technology “innovation marathon”. People come together to learn, build, and share their creations over the course of a weekend. What separates these types of events from trade shows and other industry gatherings is these events are built to focus each team on delivering a tangible product they can display and demo at the end of the event. Hackathons are sponsored by some of the world’s best tech companies, including Google, Amazon, Microsoft, Intuit, and Hivemetric – just to name a few – allowing “hackers” to receive a strong supply of technology, food, and caffeine at virtually no cost. These large events also attract some very exciting speakers, like James Whittaker, who has led projects at Google, Microsoft, and IBM among others. Companies and programmers alike recognize these events as great networking opportunities where innovative companies can connect with incredibly talented people who, by nature of the hackathon, must work collectively with multiple members of a team. While some people come with teams already formed, many teams form just before the hackathon kicks off. While the teams may have gaps initially, they are typically able to form a diverse team with multiple skill sets within an hour following the opening ceremonies. From there, teams work together for the next 24-48 hours to agree on an idea, assign tasks and responsibilities, and ultimately decide on what they want to be able to demo at the end of the weekend. Let’s take a step back and examine the structure of these events – no managers, no frameworks, no requirements – just a few bright minds sitting around a table discussing how to use each team member’s expertise to embark on a project to demo in a couple of days. Entire management and MBA programs exist to correct this type of execution and empowerment, yet here it still works. This is not to say businesses can be created in their entirety using this framework, nor that what is built will become integrated within a business. However, it does speak to the ability of small, focused teams of developers and technologists to build solutions efficiently. Here are a few reasons why hackathons are important to the tech industry and its workforce. With limited time, resources, and man-power, you have to learn how to work harmoniously with others in order to survive in a modern technological and business environment. The ability to develop and ship code as a team becomes a vital step in completing projects and meeting deadlines. At a Hackathon, people from a wide variety of educational backgrounds come together to innovate over an extremely short time frame. There is no time to focus on any individual’s background or qualifications. The best teams at a hackathon must be highly efficient, and are rarely led by a manager who must be involved in every component towards developing a solution. Teams must trust each hacker in completing their specific part of the project, and they must work together to help each other overcome specific challenges along the way. With limited time, people quickly learn how to ask for guidance from others. Hackers are exposed to a giant collection of people, endless amounts of knowledge, and varying skill sets. Although it is a competition by definition, the atmosphere remains especially neighborly – every participant at a Hackathon is extremely friendly, to a point where they will go out of their way to help you with your project. With sponsors offering access to free resources such as cloud infrastructures, APIs, hardware, and even mentors, teams have all the means necessary to build out their ideas. Hackers have time to test whether their project has the ability to become part of a larger business. While I highly encourage teams not to become overly-attached to the initial build, it is in the actual building of products that you move an idea forward. If you do not progress the idea forward, there will be competitors who are working even harder to get their own MVP into market. Hackathons provide people with an innovative setting and the fundamental resources to work on products that can have real-world utility and business potential. Building products and building prototypes are two completely different discussions. A product must be able to work within a business framework throughout its lifespan with a customer. A prototype, however, only needs to demonstrate the ability to conceptualize an idea into a tangible output. The prototype’s original framework may be discarded at some point during the product lifespan, but what matters most is the understanding of the idea being possible, then the prototype can be tested to gather feedback from your target market to refine, rebuild, and repeat. Groups do not have enough time at a Hackathon to focus on perfecting a product or even in selecting the most enterprise-ready architecture – instead they must rapidly construct a prototype of their idea. Networking as a software developer/engineer is much different than networking in traditional business. The tech field, and more specifically the programming field, is one of service to others. We build products for others to make their lives better or more productive in some way or another. The internet of things has enabled a constantly connected and informed world of technology users, and has shaped the service mentality where we look at how software from multiple sources can work collectively to enable a multitude of applications in the daily lives of people all over the world. Networking at a hackathon and within this environment is much more about spreading ideas and innovation through the use of technology than it is about individual branding and engagement. Hackathons are often attended by a company’s technical representatives, who are a huge source of knowledge, experience and expertise in their line of work. These reps are not recruiters and more likely to be engineers and hiring managers for their company. They are exceptionally welcoming to hackers of any skill level and are more than happy to help you out with debugging your project, or sometimes even to just kick back and play a quick game of Super Smash Bros, time permitting of course (thank you HackAZfor hosting the epic Smash Bros Tournament!). Hackathons tend to attract talent from across the entire country, where you get to work alongside students from very diverse backgrounds and with even more diverse skillsets. These relationships will last well beyond your long, sleepless weekend of innovation. In today’s world of interoperability and connected services, providing a product demo and clearly communicating outcomes within a technological ecosystem is more important than ever. In a corporate environment, product managers will take over this role. But in the earliest stages of product advancement and integration, developers need to understand and communicate the value and role of a product or feature. As more teams use agile development methodology as their baseline framework, developers must demonstrate what they were able to complete during each sprint and convey how it resolves the end-user story outlined by the product owner or stakeholder. Hackathons do not only allow for interactions within groups throughout product development, but they also require groups to communicate the value of their hack to an audience during the final demo – an invaluable skill essential for engineering managers and team leads as one’s career progresses. 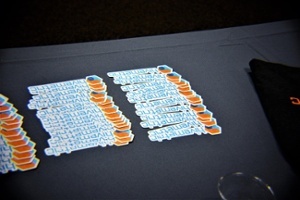 Everyone loves all of the free stickers, t-shirts, desk decor, and other hacker swag that gets passed out at Hackathons. Hackathons thank their attendees for their participation and innovation with a huge selection of cool prizes, goodies, and hacker swag freebies (not to mention all the free food!). Be sure to show off your hacker pride with these goodies to inspire others to be a part of something awesome and work to develop the ideas that they truly believe in! James Whittaker said something at the Hack Arizona Keynote that resonated with me. The future is constantly disrupting the present as the present is constantly disrupting the past. As we look into the future and attempt to see beyond the horizon, the future is being built on technology by developers. If you want to build a company that matters and continues to evolve, you must be connected to the technology getting developers excited. It will take a decade for even the newest technologies to reach the potential of becoming truly disruptive. The companies of the future that will disrupt the present are assuredly going to be led by those who can harness the creativity and development skills of the brightest engineering teams with diverse backgrounds and skillsets who can align this technological evolution with great products. At Hivemetric, we are excited to work with the companies that will disrupt entire industries. We want to give companies a tool that will help them plan how to align resources efficiently to disrupt those industries and accelerate their growth. We believe we are breaking the paradigm of managing through spreadsheets. In a connected world, we want all of your systems (HR, recruiting, marketing, accounting, etc.) to be connected to Hivemetric where we will be able to prompt you and your management teams on how to make continuous adjustments to improve performance based on your goals. We know API integrations exist and will exist far into the future, so we want help you control all of operational systems to give you the best performance while keeping your teams focused on delivering disruptive solutions. For developers, if you are one of those disruptive minds that strives to create innovative products and solutions using modern advancements in technology, and you want to work to connect the platforms that run businesses globally in a single solution, I want to personally invite you to tell us about yourself through our careers page. Please tell what makes you unique, and what you have built or want to build. Projects and stories say millions more than a resume, so don’t be afraid to be creative!